The High Court has blocked an attempt to bring a private prosecution against Tony Blair over the Iraq War. Former Iraqi general Abdul Wahed Shannan Al Rabbat alleged the former prime minister committed "the crime of aggression" by invading Iraq in 2003. No such crime exists in England and Wales and the court ruled there was "no prospect" of the case succeeding. The general had wanted to prosecute Mr Blair, ex-Foreign Secretary Jack Straw, and ex-Attorney General Lord Goldsmith. Last year, Westminster Magistrates' Court had turned down Mr Al Rabbat's bid to bring private prosecution. He then sought a judicial review in an attempt to get the Supreme Court - the UK's highest court - to overturn a 2006 House of Lords ruling that there is no such crime as the crime of aggression under the law of England and Wales. However, Lord Thomas of Cwmgiedd, the Lord Chief Justice, and Mr Justice Ouseley dismissed the general's application, saying there was "no prospect" of the case succeeding. The UK's attorney general had earlier intervened in the case, urging the High Court to block the challenge on the grounds that it was "hopeless". Reacting to the ruling, a spokesperson for the attorney general's office said the case had raised "important issues about the scope of the criminal law". "It should be for Parliament, and not the courts, to create new criminal offences. This principle was upheld when the House of Lords ruled in 2006 that the 'crime of aggression' does not exist in English law. "In this legal challenge, we argued that this remains the case today and the courts agreed." In 2003, the UK joined the US-led coalition to overthrow Saddam Hussein, after then US president George W Bush and Mr Blair accused Iraq of possessing weapons of mass destruction. Last year, the UK's Iraq War inquiry, led by Sir John Chilcot, ruled the invasion had not been the "last resort" presented to MPs and the public. His report ruled Mr Blair had overstated the threat posed by Saddam Hussein. Michael Mansfield QC, appearing for Mr Al Rabbat, argued the report justified the prosecution of Mr Blair. He said a paragraph in it could be summarised as concluding that Saddam Hussein did not pose an urgent threat to the interests of the UK. It said the intelligence regarding weapons of mass destruction had been presented with "unwarranted certainty". Mr Mansfield told the court: "Nothing could be more emphatic than this evidence. "It does not say there was an unlawful war or crime of aggression. It doesn't need to because the criteria are arguably all there in that paragraph." 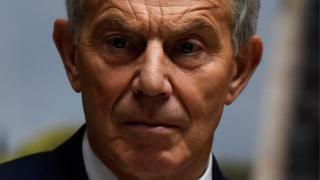 Speaking last year, former Labour prime minister Mr Blair apologised to the families of those killed in the 2003 Iraq War, but insisted he did what he thought was the "right thing" at the time. What is the Chilcot report?